When everyone wants to bang out a tune about the place, you know living in a happening area! Check out our growing list of Brixton-related tunes. Drop us a line if you know of any others. 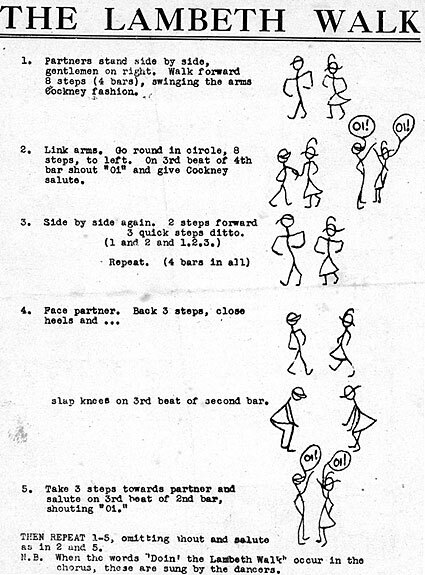 These instructions from 1937 show dancers how to perform the 'Lambeth Walk', a popular dance set to music by Noel Gay. "Everybody seems to just turn a blind eye On the 159 to Brixton, when a blonde girl cries... "
Fact! David Bowie was born and lived at 40 Stansfield Road, nr Stockwell Rd, SW9. Fact! Jimi Hendrix used to regularly play Brady's bar (Railway). Fact! Buffalo Bill lived in Brixton Water Lane at the turn of the century and kept his animals on Brixton Common.